ILS offers a range of Reference and Certified Reference Material (CRM) solutions to cover your commodity of interest. We provide reference material from leading Australasian manufacturers including Rocklabs, Geostats, Western Minerals and Gannet Holdings. We can also supply other CRM’s including SARM, CANMET and NIST. Standards are available for exploration and drilling programmes, laboratory method monitoring and laboratory method set-up and calibration. We also offer a complete element range of reference standards (e.g. Au, Pt, Pd, base metals and S), multi-elemental standards, iron ore & bauxite standards, low level gold for greenfield exploration and gold and silver on carbon reference standards. 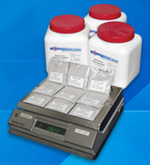 Reference material can be supplied in packs or jars. Pack sizes range from 50g vacuum-sealed sachets to 5kg vacuum-sealed bags. 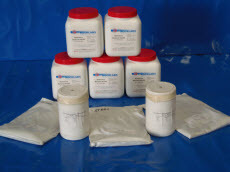 Jars can be supplied from 250g jars up to 2.5kg jars. Each Standard/CRM comes with a certificate of certified value(s).